It’s been a while since I posted about a walk on here. It’s not for lack of days out. It’s just that I’ve been trying to write the tale of my Cuillin Ridge traverse and struggling to get it to a reasonable length (unlike the walk itself). It’s going to be a tale of disappointment and joy. Pain, exhaustion and seafood. And camping. But having written just about the experience so far it’s something like the length of a short novel. And you don’t want that. In the meantime I thought I’d share a shorter tale of a longer walk I did a few weeks after the Cuillins. Welcome to the Rhinogs! Or Rhinogau. Or whatever you want to call this remote, lesser visited corner of north Wales sandwiched between the more famous regions of Nantlle and Cadair Idris. I’d been looking into traversing the secretive Rhinogs for a while, and found there’s a lack of useful information on the internet apart from a couple of walk reports on Walkhighlands, next to nothing in any of my books, and so I just bought a map and tried to figure it all out myself. The first challenge was logistics. There’s no way of making this 20-something kilometre traverse into a circuit walk so start and end at your car. There’s trains and buses but timings are irregular. But I thought I had it more or less figured out to get it done over a weekend, and still be back at work in Bristol by Monday morning. My plan was to drive to Barmouth Friday evening, catch the train to Llandecwyn on Saturday morning at 10am, walk south across various mountains and wild camp along the way, then end up back in Barmouth Sunday afternoon ready to drive home. The first challenge was to find somewhere to stay. 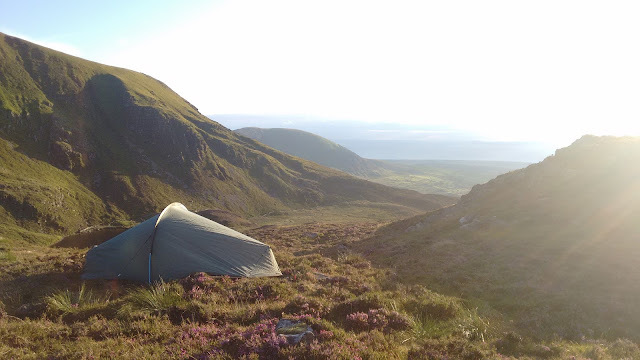 I rang the nearest campsite to Barmouth the week before and was told in no uncertain (and actually somewhat unfriendly) terms that under no circumstances would the campsite accept the two of us (me and regular mountaineering bud Joe) turning up around midnight and pitching up for the night. There was no way I was going to pay for a B&B for a few hours sleep, so we drove up Friday evening with nowhere to stay, and hoping to just find somewhere we could pitch up. Barmouth isn’t really like that. Even when we arrived at midnight the town was really busy, and the narrow strip of town doesn’t lend itself to a roadside wild camp! In the end, in desperation we drove back in the direction of Dolgellau and found a layby set back from the road which already had a couple of cosy looking camper vans in it, and we set about finding a way in which two grown men could sleep in a Peugeot 106. Needless to say that’s not easy. Somehow Joes ended up across the two front seats with a handbrake in his ribs, and I found myself folded into an L shape with my feet numb with cold in the boot and my head on the remaining back seat of the car. 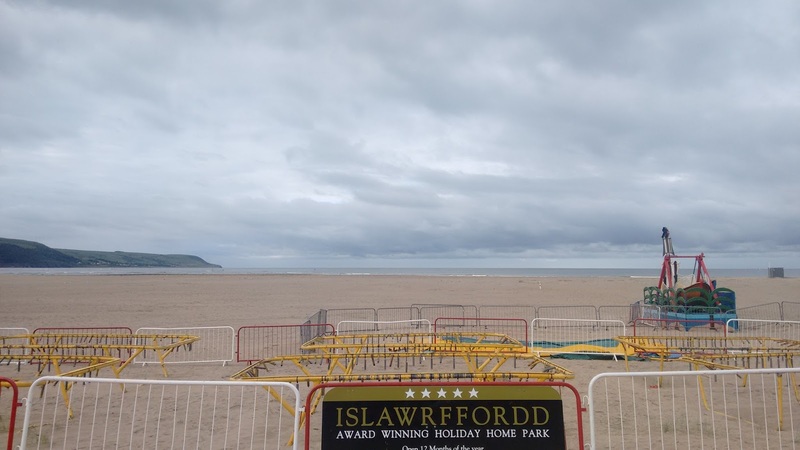 After an uncomfortable nights “sleep” we got up with the sun around 6am and drove into Barmouth to see if we could find a place to safely leave the car for a night without getting ticketed. A call to the tourist information centre about this prior to our arrival resulted in total misinformation. They’d told me there were no parking restrictions along the seafront; this is a lie. Luckily not far west of the main town parking restrictions ended so we parked the car on the street and went looking for breakfast. Which was hard to find as nowhere in the town opens until 9am! Eventually it was time to get the train. Only when we got to the station the trains were cancelled because of the usual signalling problems. And the next bus going our way wasn’t until 11am, meaning we wouldn’t start our longest planned day until at least 12. Not much use. We found a taxi driver nearby, who, knowing the trains weren’t running and that buses were irregular decided to stitch us right up and charge us £30 for the ride up the coast; a journey which couldn’t be worth more than £15. Nonetheless we got dropped off in a layby at Talsarnau and were finally on our way in glorious sunshine with Moel-ddu looming to the north of us and the Rhinogs hidden to our south east side. The early part of the journey is an easy meander alongside roads and meandering paths over small hills, beside lakes and into remote farmland. Here we bumped into an extremely friendly lady and her dog who’d just completed the same traverse but from south to north. We exchanged notes and plans and she went off in search of well-deserved beer and relaxation, while we hitched up our bags and pressed on to start the first real slog from Nant Pasgan-bach to Diffwys. With heavy loads the ascent took a lot of effort but it felt amazing to be in such a remote part of Snowdonia with no one else in sight. From atop Diffwys we could see the way ahead more clearly, over rough patchy terrain of loose stone, steep cliffs and endless heather and scree. From Diffwys we headed south west to the rocky summit of Foel Penolau, before skirting its steep ramparts to scramble down to the col between it and Moel Ysgyfarnogod, and another steep grassy trudge to the summit cairn there. From Moel Ysgyfarnogod the true nature of the Rhinogs was visible stretched out before us. Looking due south the land was split; on the right a steep, layered craggy plateau of stone, heather and bilberry. On our left a deep valley of streams and bog with thick forest far to the east. In much of the Rhinogs well constructed walls are key navigational features which point the way. Far to the south we could see a wall that we knew led the way to the path we could follow, but to avoid losing height we contoured around the plateau heading over Craig Ddrwg before descending a steep gully with an incredible dry stone wall built right up into it to meet the path. Much of the ground was treacherous. Heather and bilberry covers the rocky ground and occasional holes in the rough stone and we frequently lost our lower legs into these, meaning our going was slow and cautious. Once on the path we could follow this easily to Cwm Bychan at the head of Llyn Cym Bychan. The boggy way down was lost from time to time in deep ferns but we battled our way down through these over more treacherous ground to reach the campsite at the head of the llyn. Here we once again bumped into the lady we’d met at the start of our day. I wish I’d got her name as it would be nice to be able to thank her personally on here for the help she gave us before we headed off on the next leg of our journey. Her hints were invaluable! Our plan had always been to camp below Rhinog Fach at Llyn Hywel, but the afternoon was already well advanced and we knew we had a long way to go. As we headed up the Roman Steps in the direction of Rhinog Fawr most people we passed were on their way down from the mountains and heading home/to their campsite for the evening. We were definitely the only people still headed upwards. The Roman Steps route was the most well constructed and well maintained path we’d been on all day and it was a relief for our feet and legs not to be bashing through heather and potholes for a few kilometres. After the steep dash up to Llyn Du nestled below the steep and rocky summit of Rhinog Fawr we knew time was pressing on. And we knew our destination for the night was still a good couple of hours away. We stashed our bags at the llyn, and, unburdened very quickly rounded the north side of the llyn and scrambled to the summit of Rhinog Fawr in no time at all. Moving without all our kit on was absolute joy by this time! The sun was still warm and we enjoyed for a couple of minutes the view south to Rhinog Fawr, which seemed so close from the summit. But at the same time we could see just how far we would have to descend to reach the entrance to the cwm which would allow us up to Llyn Hywel. Back at Llyn Du we grabbed our stuff and followed the directions we’d been given back at the campsite to pick up the path at the large wall that tracked roughly south west from Llyn Du and contoured around the lower ramparts of Rhinog Fawr. From here the navigation was easy, but the going remained tough where the heather covered ground hid lethal holes. I kept my strength up with endless handfuls of bilberries which were literally everywhere carpeting the hillside. It seemed to take forever to reach the path that followed the river to the entrance of the cwm headed up to the llyn were aiming for, and we were both getting tired. We were really feeling the lack of sleep from the night before. The trek up the cwm seemed to take forever, and a few times we thought we were close to the llyn we reached yet another deceptive plateau. Finally, just as the sun was setting, around 9 hours after we’d set off we reached the shores of Llyn Hywel. A few tents were already pitched at this remote wild camping spot, and we headed to the south side of the llyn to catch the last of the warmth from the setting sun and pitched our tents on wide patches of soft heather away from the boggy and midgey sides of the water. It was at this point that Joe realised his vegan gluten free boil-in-the-bag curry he’d been looking forward to all day was sat safely in a bag on his kitchen side in Bristol. As all of my food was full of the joys of meat and gluten I didn’t have much to offer him, so he had to make do with hummus and sulking while I ate my dinner. I soon cheered him up with whiskey as the evening began to get very cold. Once the sun was gone it got really cold. At around 530m Llyn Hywel isn’t exactly a high wild camp, but it seemed enough to make hanging around outside uncomfortable. Plus we were both exhausted so an early retirement to my tent seemed perfectly acceptable. We awoke the next morning to thick low cloud, and breakfast and breaking camp was over before the sun came out to lift the fog and reveal the views to the sea to our west. To the eastern side of Llyn Hywel a narrow col topped by a high wall separates the rocky summit of Rhinog Fach from the broad, grassy summit of Y Llethr. We left our bags at the lowest point of the col leant up against the wall and followed a steep path to the summit. From here we could see an outstanding looking rock line up the steepest route to the summit which we will definitely head back for one day. The cloud was thick at the top and views were non-existent. We headed back to the col and chatted for a few minutes with some of our fellow wild campers who were heading to the summit before making their way back down toward Llanbedr. Y Llethr, despite being the highest point of the walk, was probably the easiest summit to reach. Set back from the steep grassy sides of the peak a rounded summit led to a cairn. From here the route south to Barmouth looked easier; a series of wide, rounded mountain summits with easy navigation along the drystone walls and then a gradual descent to the town. What I hadn’t really appreciated until this point, looking at the map, was just how far it was! Day one had been a long day of steep trekking, but day two looked like it was going to be almost as long, but just hitting long paths over another few high summits. The summit of Diffwys (this time a mountain summit rather than the hill of the same name the day before) took an age to reach, and there was a cold wind high on this broad peak. This wind stayed with us as we walked forever southwards, sticking to the high walls for kilometre after kilometre, cairn after cairn, until we finally began the long descent towards Barmouth. Endless walls. And some runners. And Diffwys. For the last couple of K the sun came back out and the wind dropped and we could really enjoy the views across the hills to the sea, and the splendid isolation of these remote hills. It’s unusual to finish an epic walk like this in the middle of a main town. Usually my end of trek cravings for things like good coffee and fried chicken are destined to go unsatisfied until a motorway service station. For once though, they could all be satisfied within minutes of reaching the end of the walk. We ditched our bags at the car, and immediately had our fill of coffee, soft drinks and food. 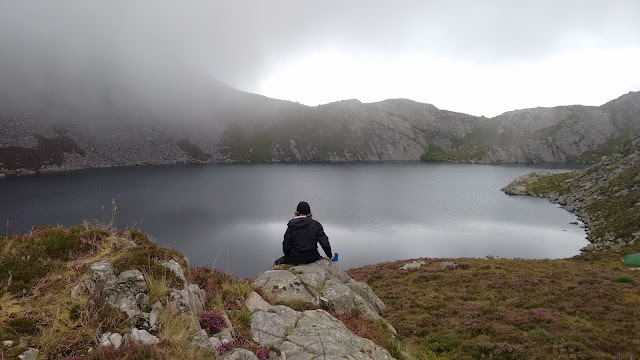 The Rhinog traverse is an epic two day walk, with scenery in places taken straight out of the highlands of Scotland, and a sense of remoteness impossible to find in the rest of Snowdonia. Even in the depths of the Carnedds you would come across more people or groups, yet with the exception of around Rhinog Fawr we scarcely saw another person. Llyn Hywel is an outstanding spot for a wild camp, but there were other places we passed which could have been equally good and even more isolated had we wished. The going is tougher than most other north Wales areas, a side effect of the lower levels of foot traffic through the range I suppose, and the variety of routes you could choose to take. It’s a far wilder part of the north Wales landscape then most places I’ve been to, and if you want to get off the beaten track it’s a brilliant place to visit. I've heard about the Rhinogs being the roughest and most remote part of Snowdonia, so I promised myself to pay them a visit if ever I'm back in Wales. Great to see a report about them. Nice one. A good weekend's walk. The Rhinogs are one of my favourite areas in Wales. By walking down to Llyn Cwm Bychan, rather than sticking to the ridge, you avoided the worst bit - known colloquially as the 'Badlands' (which may be a good thing) - scarcely unchanged since the last ice age up there, but very very rough. Also, (if you ever go again), there is a route of sorts off Rhinog Fawr to the south, which gets you to Bwlch Drws Ardudwy quicker than a return to Llyn Du. Brought back some memories from 1969/70 when I camped by Llyn Hywel and nipped up Rhinog Fach. It was summer and hot and clear. Pitching the tent on the heather made for a very comfortable night.